This whole lifetime is, at one level, meaningless. There’s no success. And no failure. When you die, you take nothing, not even memories of your experiences. You may wonder what’s the point in living – earning, creating, saving – when you can’t take anything or anyone with you when you die? But this is the truth. This is the way it is. None of us knows what’s after death. So, we can only ensure that we live this one Life that we have well. This means we treat everything that comes our way – sadness, joy, love, anger, fear, passion and peace – with respect, with acceptance and with gratitude. 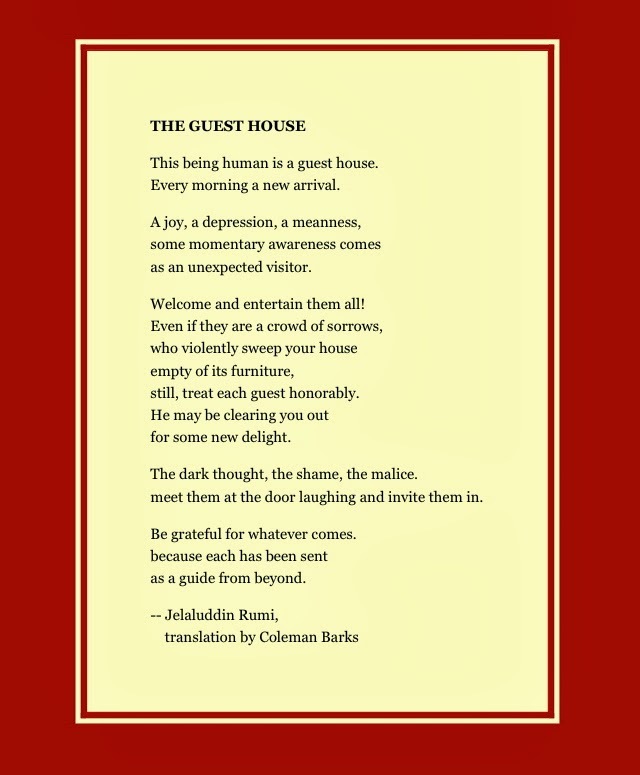 In his immortal poem “The Guest House”, Mevlana Jalaluddin Rumi, the 13th Century Persian poet says, receive both Life’s sorrows and joys with respect, greeting them at the door “laughing” and “invite them in”, for each has been sent as a “guide from beyond”. There’s only one reason that I believe there is to describe why we go through so many experiences in our Life – and that reason is to teach us to be humble. What education, success, fame and money do to us is that they all make us, even if subconsciously, arrogant. We start gloating over how well we have planned out lives, how much we are in control and how well we have crafted our own tiny worlds. And then, in one fell swoop, Life changes everything. It’s like a wave that comes and sweeps away a sandcastle that a child has built on the beach. For some of us, these waves come multiple times and with each blow, with each upheaval, we become more and more humble. That’s all there is to Life. Keep enjoying and experiencing the journey, learning from it, every step of the way. Don’t cling on to anything. Neither your sorrows nor your joys. Take everything as it comes. If possible, during the time that you have here, on the planet, touch another Life, make a difference. That’s the only way to create meaning in an otherwise meaningless Life! Because, when it ends, when death comes, your lifetime will be a memory for those who knew you, and for you…it may, well, just mean nothing.